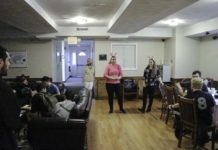 This holiday season, the University of Rhode Island tour guide team is giving back by adopting a family through the Children’s Friend and Family Services organization. The team is fundraising money which they will use to supply a family with presents. This idea of adopting a family has been a tradition for the team. Scheepers referred to it as a type of bonding exercise for the group which helps them become closer and create a positive atmosphere. The whole team shops for the families after raising money and are able to work towards one goal of making a family happy. With the group effort the tour guides put into this, it brings them closer together during this cheerful holiday season. She said the whole team loves to be able to give back and create a positive environment. It allows the team to feel as though they are improving someone’s life and allowing them to have a happy holiday. By bringing happiness to others, it makes the team members equally as happy to know they created that feeling for them.